"Dark Reaper" redirects here. For the use in Warhammer 40,000, see Eldar (Warhammer 40,000) § Dark Reapers. 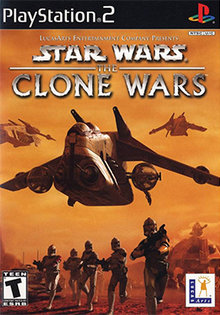 Star Wars: The Clone Wars is a video game developed by Pandemic Studios and published by LucasArts for GameCube, PlayStation 2 and Xbox. 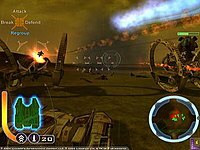 This game mostly consists of vehicular combat, such as clone war ships, starfighters, speeder bikes and tanks, although there are a few times on certain missions where the player controls Anakin Skywalker and Mace Windu. The game is split up into two segments, vehicles and third-person person Jedi fighting. The vehicle segments involve most vehicles from the Star Wars universe: STAPs, tanks, AATs, AT-XTs, and Republic gunships. The controls used involve primary and secondary fire, acceleration and a special ability that changes from vehicle to vehicle. The Jedi segments use basic lightsaber slashing and two force powers, which rely on a force power bar, lightsaber throw and force push. The game begins with the Battle of Geonosis from Episode II: Attack of the Clones. Jedi Masters Mace Windu and Luminara Unduli lead a strike force of Jedi to weaken Separatist defenses and rescue Anakin Skywalker and Obi Wan Kenobi. As Anakin and Obi Wan are rescued, an army of Clone troopers arrive and battle the Separatist droid armies as Windu takes part in taking out key Separatist ships. Later on in the story Anakin and Obi Wan organize an evacuation of a Republic outpost on Rhen Var, leading the escape only minutes before the Separatist Army captures the planet. One month after the Battle of Geonosis, the Republic detects unusual activity on Raxus Prime, and sends a strike force led by Anakin and Obi-Wan to investigate. On arrival, they find Separatist forces at an excavation site. They send for reinforcements to take the planet. The Republic captures Raxus Prime, but during the battle, Anakin is captured by Sith Count Dooku and his bounty hunter Cydon Prax. Anakin is sent to Alaris Prime, the Kashyyyk moon, to be executed. Anakin and the other prisoners are doomed to be killed by the Force Harvester, an ancient Sith weapon that drains the Force from all living things within its range. Anakin is able to escape his cell and uses a speeder to escape the Force Harvester's range. Anakin, with help from a female smuggler named Bera, infiltrates a Separatist communications outpost to contact the Republic for help. Then Anakin, Bera and the local Wookiee population hold off the Separatist forces until Republic reinforcements arrive. Republic forces, led by Obi-Wan, arrive on the moon. Anakin and Obi-Wan then lead a counterattack against the Separatists and successfully liberate Alaris Prime. Anakin returns to the Jedi Temple on Coruscant and informs Jedi Master Yoda and Windu of the Harvester. Windu then tells Anakin and Obi-Wan of the Dark Reaper, an ancient Sith weapon built during the Great Sith War that was so powerful that none could withstand it. It required large amounts of energy to operate, which the Harvester could provide. Windu then mentions that the Reaper was destroyed by a fallen Jedi Knight Ulic Qel-Droma, and the remains of the Sith weapon were scattered by the Jedi across the galaxy. To learn more about the Dark Reaper, Anakin and Obi-Wan lead Republic forces to Rhen Var to retake the planet from the Separatists, Qel-Droma's final resting place. After a long battle, Anakin is led to an ancient tomb, where he meets Qel-Droma as a force ghost, who agrees to teach Anakin how to defeat the Dark Reaper and reveal the location of the Sith Weapon. Qel-Dromo at the same time warns Anakin that this knowledge and power could lead him to the Dark Side. With the Dark Reaper located on the ancient Sith-world Thule, Anakin, Obi-Wan, and Windu lead Republic forces to Thule to prevent the Sith weapon from being rebuilt. Before the Republic can invade Thule, Anakin leads a strike force on the planet's moon to take out the planetary shield generator. Once on Thule, Obi-Wan and Windu lead Republic forces in eliminating Separtist defenses guarding the planet capital Kessiak, where the Sith Temple that holds the Dark Reaper is located. As the defenses fall Republic forces enter Kessiak. While the Jedi and Republic forces battle the Separatists in Kessiak, Anakin enters the Sith Temple to destroy the Dark Reaper. Inside the temple, Anakin kills Cydon Prax and confronts the Dark Reaper, now operational. With guidance from Qel-Droma, Anakin is able to destroy the Dark Reaper and claim victory for the Republic on Thule. Obi-Wan acknowledges Anakin's growing power, but warns him to not let it consume him. As Republic forces are leaving Thule after the battle, Windu believes that the battle turned the tide of the war, but Yoda reminds him the war is far from over. The game achieved mixed to positive reception on online gaming website reviews. GameRankings and Metacritic gave it a score of 75.33% and 73 out of 100 for the GameCube version; 70.46% and 72 out of 100 for the PlayStation 2 version; and 74.74% and 71 out of 100 for the Xbox version. ^ a b "Star Wars: The Clone Wars for GameCube". GameRankings. Retrieved August 13, 2014. ^ a b "Star Wars: The Clone Wars for Xbox". GameRankings. Retrieved August 13, 2014. ^ a b "Star Wars: The Clone Wars for PlayStation 2". GameRankings. Retrieved August 13, 2014. ^ a b "Star Wars: The Clone Wars for GameCube Reviews". Metacritic. Retrieved August 13, 2014. ^ a b "Star Wars: The Clone Wars for PlayStation 2 Reviews". Metacritic. Retrieved August 13, 2014. ^ a b "Star Wars: The Clone Wars for Xbox Reviews". Metacritic. Retrieved August 13, 2014. ^ Edge staff (December 25, 2002). "Star Wars: The Clone Wars (GC, PS2)". Edge (118). ^ EGM staff (December 2002). "Star Wars: The Clone Wars (GC)". Electronic Gaming Monthly (162): 142. Archived from the original on January 24, 2004. Retrieved August 14, 2014. ^ EGM staff (June 2003). "Star Wars: The Clone Wars (Xbox)". Electronic Gaming Monthly (168): 114. ^ Bramwell, Tom (November 25, 2002). "Star Wars: The Clone Wars (GC)". Eurogamer. Retrieved August 14, 2014. ^ Reiner, Andrew (June 2003). "Star Wars: The Clone Wars (Xbox)". Game Informer (122): 113. Archived from the original on November 15, 2004. Retrieved August 13, 2014. ^ Reiner, Andrew (December 2002). "Star Wars: The Clone Wars (GC)". Game Informer (116): 126. Archived from the original on August 27, 2004. Retrieved August 13, 2014. ^ Reiner, Andrew (February 2003). "Star Wars: The Clone Wars (PS2)". Game Informer (118): 98. Archived from the original on November 14, 2004. Retrieved August 13, 2014. ^ Dr. Zombie (October 31, 2002). "Star Wars: The Clone Wars for GameCube on GamePro.com". GamePro. Archived from the original on February 14, 2005. Retrieved August 13, 2014. ^ Fennec Fox (January 8, 2003). "Star Wars: The Clone Wars Review for PS2 on GamePro.com". GamePro. Archived from the original on February 12, 2005. Retrieved August 13, 2014. ^ Fennec Fox (May 2, 2003). "Star Wars: The Clone Wars Review for Xbox on GamePro.com". GamePro. Archived from the original on February 14, 2005. Retrieved August 13, 2014. ^ G-Wok (November 2002). "Star Wars: [The] Clone Wars Review (GC)". Game Revolution. Retrieved August 14, 2014. ^ Kasavin, Greg (October 30, 2002). "Star Wars: The Clone Wars (GC)". GameSpot. Retrieved August 13, 2014. ^ Kasavin, Greg (April 24, 2003). "Star Wars: The Clone Wars Review (Xbox)". GameSpot. Retrieved August 13, 2014. ^ Kasavin, Greg (December 9, 2002). "Star Wars: The Clone Wars Review (PS2)". GameSpot. Retrieved August 13, 2014. ^ Steinberg, Scott (October 28, 2002). "GameSpy: Star Wars: The Clone Wars (GCN)". GameSpy. Archived from the original on December 6, 2005. Retrieved August 14, 2014. ^ Steinberg, Scott (January 5, 2003). "GameSpy: Star Wars: The Clone Wars (PS2)". GameSpy. Archived from the original on December 30, 2005. Retrieved August 13, 2014. ^ Meston, Zach (April 25, 2003). "GameSpy: Star Wars: The Clone Wars (Xbox)". GameSpy. Archived from the original on December 4, 2005. Retrieved August 13, 2014. ^ Bedigian, Louis (November 3, 2002). "Star Wars The Clone Wars - GC - Review". GameZone. Archived from the original on January 25, 2009. Retrieved August 13, 2014. ^ Knutson, Michael (December 21, 2002). "Star Wars: The Clone Wars - PS2 - Review". GameZone. Archived from the original on December 31, 2008. Retrieved August 13, 2014. ^ Zacarias, Eduardo (May 18, 2003). "Star Wars The Clone Wars - XB - Review". GameZone. Archived from the original on January 25, 2009. Retrieved August 13, 2014. ^ Boulding, Aaron (April 22, 2003). "Star Wars: The Clone Wars (Xbox)". IGN. Retrieved August 13, 2014. ^ Lewis, Cory D. (October 22, 2002). "Star Wars: The Clone Wars (GCN)". IGN. Retrieved August 13, 2014. ^ Dunham, Jeremy (December 13, 2002). "Star Wars: The Clone Wars (PS2)". IGN. Retrieved August 13, 2014. ^ "Star Wars: The Clone Wars". Nintendo Power. 163: 212. December 2002. ^ Baker, Chris (February 2003). "Star Wars: The Clone Wars". Official U.S. PlayStation Magazine: 102. Archived from the original on March 27, 2004. Retrieved August 14, 2014. ^ "Star Wars: The Clone Wars". Official Xbox Magazine: 80. July 2003. ^ Walk, Gary Eng (November 15, 2002). "Starship Trooper (Star Wars: The Clone Wars Review; GameCube, PS2)". Entertainment Weekly (682): 144. Retrieved August 13, 2014. ^ Steinberg, Scott (November 28, 2002). "Star Wars: The Clone Wars (PS2, GC)". Maxim. Archived from the original on November 27, 2002. Retrieved November 20, 2014.